Lemon Balm plant, Melissa officinalis, is a rhizome based perennial plant with lemon scented foliage which in late in summer produces small whitish yellow flowers. Traditional European folk use of the tea as a remedy for anger, depression and anxiety. Leaves are stuffed into pillows as a folk remedy for insomnia. Fresh leaves are also used to flavour vinegar and salad dressing. Balm steeped in wine is good for the memory. Used in pot pourri and as companion plant. Also known as “Melissa”. 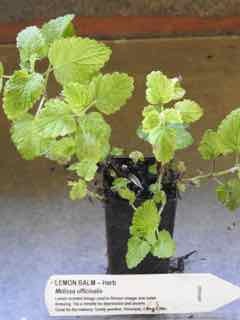 Lemon Balm plant is native of Southern Europe and prefers light, well drained soils in an open, sunny position. Drought and frost resistant. A perennial plant, growing to a height of 0.6m with a spread of 0.50m. Be the first to review “Balm, Lemon plant” Click here to cancel reply.